Erin’s Hair Garage is the right place for anyone who wants quality service(s) in comfortable surroundings. At The Hair Garage we strive to provide an environment for most everyone…it’s gender neutral and as familiar as pulling into your own garage or pole barn. There are the hard elements of the tool chests, street signs and diamond plate that mingle with the soft elements of a pedicure chair, beautiful hair art and talented stylists, that create a very different feeling from just about any other salon you have been in. There is even a special place for the “little ones” who are uneasy about having their first haircut. 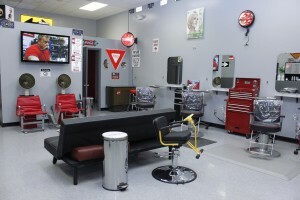 It’s our bet you have never seen a place like the Hair Garage, simple, elegant, professional, fun, and comfortable. Try the Hair Garage the next time your look needs a little “tune-up”, we are sure you will be back.